All Hayward In-Ground Pool pumps shown are available at Monarch Pools & Spas. Super Pump is the world’s best-selling pool pump that is efficient, dependable, and proven, setting the standard for excellence and value. 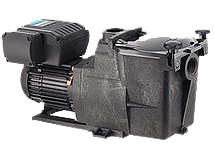 For new construction and the aftermarket, Super II is the reliable pool pump that offers high performance capabilities as an upgrade path for medium head pumps. For entry-level new construction and aftermarket applications, MaxFlo XL™ is the medium head pool pump that provides advanced hydraulics and the latest conveniences while maintaining the economy and performance of the proven MaxFlo.